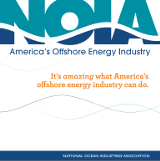 NOIA publishes The Washington Report in hardcopy and digital formats semi-annually following our Spring and Fall membership meetings. Additional digital issues are published when warranted. This content is for NOIA members only. If you are already a NOIA member, please SIGN IN HERE to view this content. If you are not a NOIA member and are interested in joining, please fill out the member application here or contact Franki Stuntz at franki@nullnoia.org.